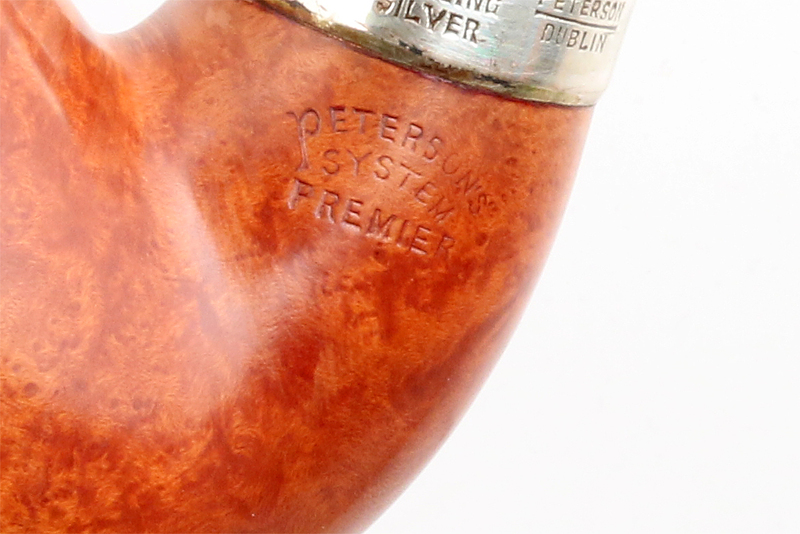 According to my co-author Gary Malmberg, Petersons are the second most-datable pipes with a long history, after Dunhills post-1920 (which as a rule all have a date code) and Ashton. 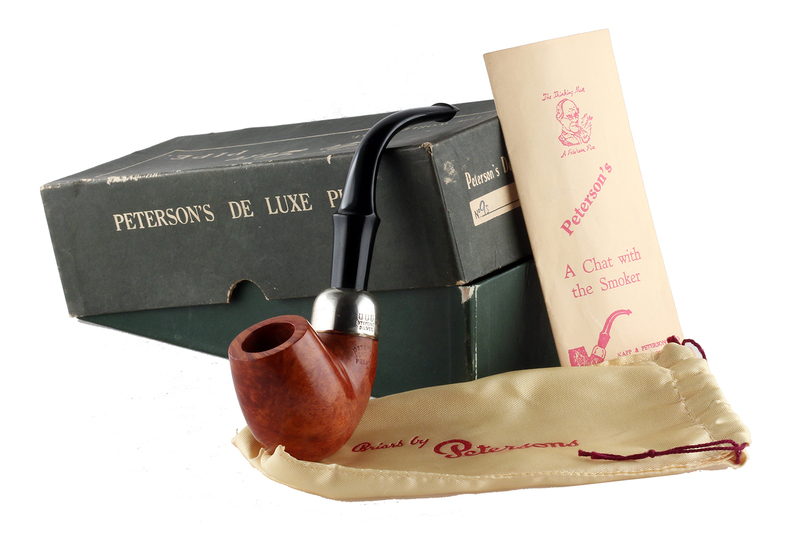 Every pipe has a story, even if most of those stories are lost, but one of the things we hope the Peterson book and a few of the major catalog reprints will do is help collectors learn how to read the story of each Peterson they companion or are thinking of adding to their rotation. 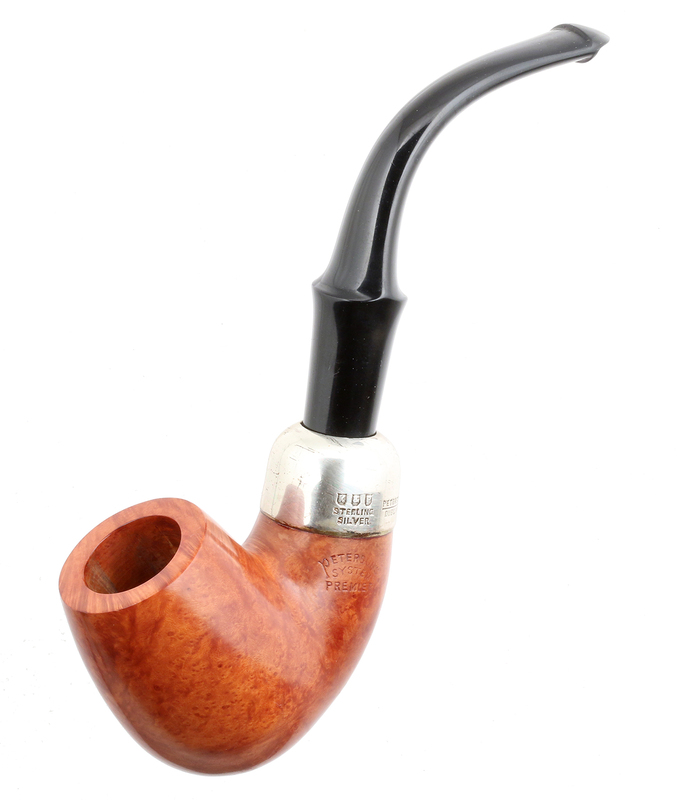 I thought I might use the pipe pictured above as an example, which arrived a few weeks ago. The pipe we’re looking at appears to be new, or at least “new / old stock,” but how old, exactly? The first place to begin, of course, is with the bowl itself. When dealing with a Peterson pipe, this means knowing a little about the bowl’s line, shape number(s), shape changes, and chuck marks. 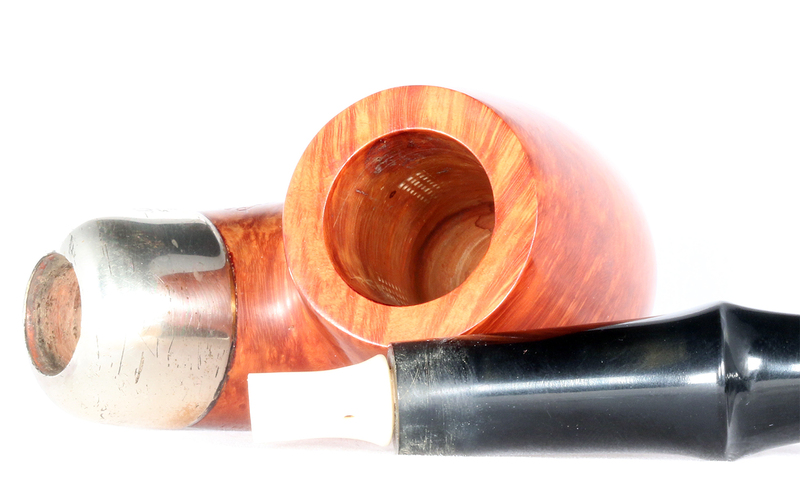 Unlike many other pipe-makers who sand out the chuck marks from the lathe inside the chamber, Peterson has, since the beginning, simply left them. Usually these four bands of pin-points can be seen even when covered by the dark vegetable-base “paint” used in later years (which is not a pre-carb, by the way). The chuck marks are your guarantee that what you’re buying is really “new / old stock” and not a pipe that has been expertly reconditioned. A minor point, but fun to know, I think. The 300 shape series numbers were in place by the 1937 catalog, and the book details the evolution of how they came about, as well as providing a cross-reference table of System shapes with other series numbers. Originally this was a Patent shape 11, described in the ephemera as a “large billiard.” Today’s 11S is the shape as it is deployed in the De Luxe System line. The shape has had two other numbers: the X220, also in use today in the Classic (or non-System) Range, and the 72, its old Dunmore Premier System number. This only tells us what we will find out from other evidence: that the pipe was made after 1937 or so. But redundancy, as communication theorists know, is a welcome tool. While the vast majority of shapes in the Peterson catalog have exactly the same external dimensions they did when they were first introduced (barring slight differences caused by sanding and sandblasting), there are a few that have changed slightly over the years. The 999 springs to mind as the most obvious example, morphing as it did from a chubby author (“John Bull”) to a leaner rhodesian. But the 312 has also changed over the years, becoming slightly less curvy, a little thinner in the shank, and a bit shorter. You can see this in the two photos below. In the first, from left to right are height examples from the Eire era, the Early Republic era, the Late Republic era, and the Dublin (present) era. As you can see, the two on the left are the same height and the two on the right are the same. At some point between the late 1940s and the late 1970s, the bowl was shortened a bit and given a slightly thinner shank. You can see this in second photo, but I’ll be the first to admit it’s easier to grasp what I’m saying if you have several examples laying in front of you that you can pick up and measure with a caliper. When a Peterson has a band or a ferrule, this is often the best place to begin. Peterson has only had five or six silversmiths in its long history (an amazing fact), and each has had his distinctive style of turning. 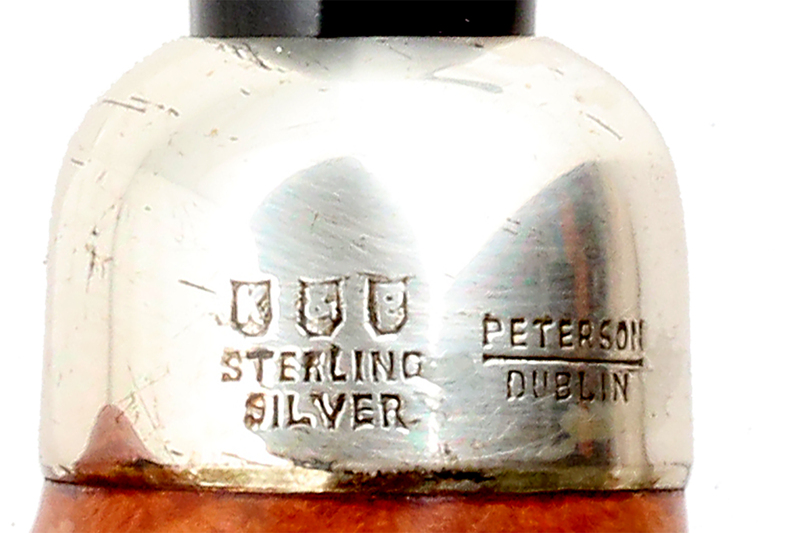 The pipe shown here has a sterling band, and is stamped with the old maker’s mark K & P in shields over STERLING over SILVER and to the right PETERSON over a ruled line over DUBLIN. Looking at the hallmark chart in the encyclopedia chapter, we read that, having no hallmarks, this ferrule was turned between 1939 and 1968. During many of those years and even today in some lines, the K & P shields are used as a sterling mark. 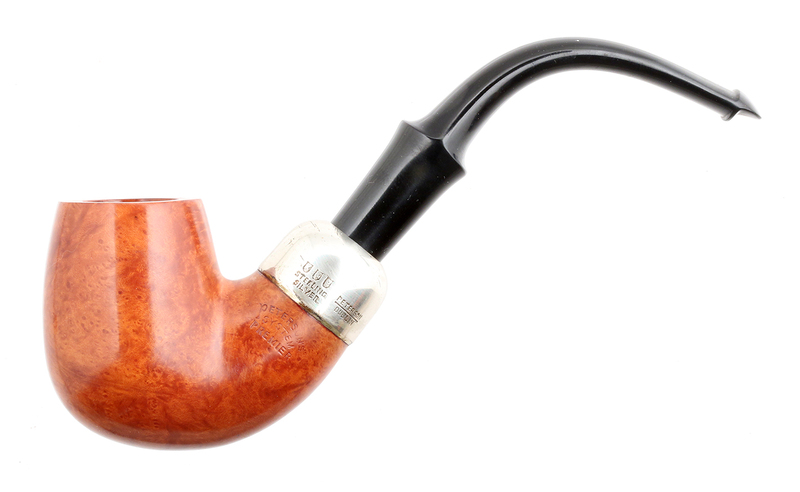 Because many Peterson pipes don’t have silver or banded work, many pipemen begin their reading with the nomenclature on the briar itself. 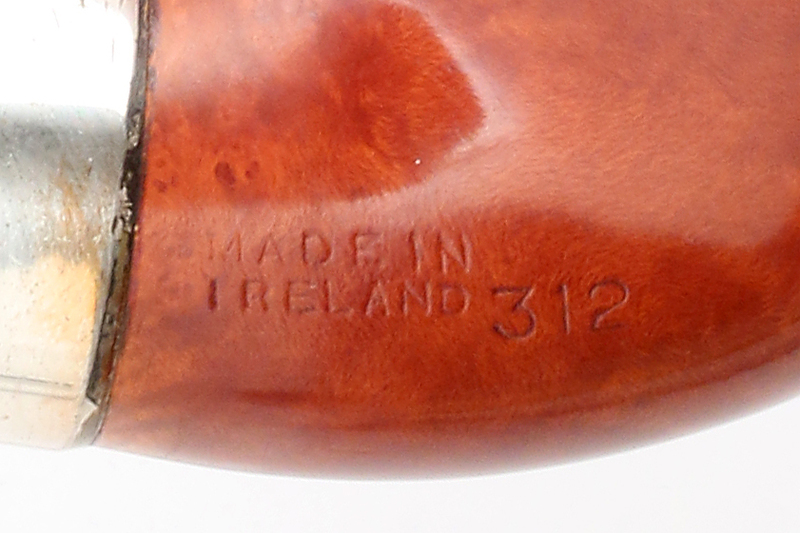 In the case of this pipe, we begin with the COM or Country of Manufacture stamp on the reverse side, which reads MADE IN over IRELAND in two lines. Consulting the encyclopedia, we find that this stamp, alas, doesn’t help us at all, as it has been used since the early 1920s, although it was aggressively revived in the late 1940s. It has, furthermore, been used in most every decade since it appeared. Still, let’s hold on to that “aggressively revived in the late 1940s” as a clue. The obverse stamping bears an arched forked-P PETERSON’S over arched SYSTEM over a straight PREMIER. “At last!” we think—that forked-P must mean it’s an older pipe, what pipemen have called “Pre-Republic” before they were able to consult the book and learn a more precise taxonomy. But alas, no. According to the encyclopedia, the forked-P in several variations, while it was in use from the earliest Patent days, has also been used with some frequency well after 1949. Let’s move on to the stem. Here we have our first real advance within the 1939 – 1968 perimeter. In the chapter on smoking the System pipe, we find a sidebar on stem bends, and throughout the book there are representative catalog pages from each era of Peterson production. This particular bend, called in the book a “boomerang,” occurs at the middle of the stem and is approximately 120 degrees. I love this bend, because it brings the pipe closer to the smoker, making it weigh less when clinched than other bends (the “moment arm,” I think my dad the engineer calls it). Examples of the boomerang are found as early as the 1896 catalog, but became widespread in the late 1940s, then seem to have disappeared entirely by the early 1960s, which is why they look so striking to contemporary pipemen. Then there’s the tenon extension, and here we hit another piece of vital information. It’s white, and it’s made of bone. If we needed any additional proof that this is an unsmoked pipe (! ), this is it, as the bone tenon colors immediately with the first smoke. The bone tenon, according to the craftsmanship chapter’s interviews with artisans at the factory, was discontinued around 1960, when it was replaced by aluminum. 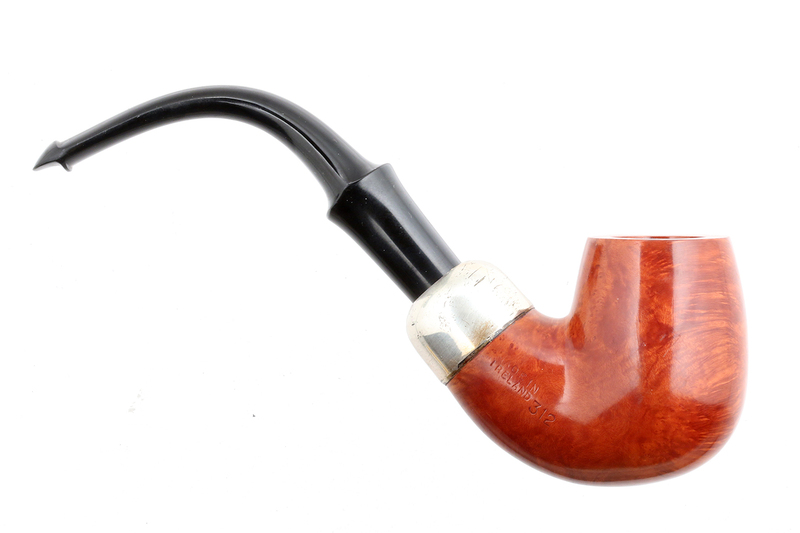 So now we have a pipe whose vintage lies between 1938 and 1960 – a period of 22 years. So much for the evidence of the pipe itself. The reason I always go on about saving the box and papers of a pipe comes into play here, as the pipe was received in the sock, box, and with the papers shown below. It is, of course, possible that someone found this old box in an attic and just stuck the pipe in it, but it seems unlikely. That the box has been hand-marked “9s” on the end is typical for the age of brick-and-mortar pipe shops, when boxes were stored under the counter or in cabinets behind the counters. If you’ve ever bought a pipe in a real pipe shop, you’ll know what I mean: the clerk is anxious to make the sale and has no time (or interest) in finding the right box, if he still even has it. Having said that, the papers, while incomplete, do contain the “Chat with the Smoker” brochure, which we discuss in the book and I won’t spoil for you here. But that brochure tells us the pipe, if this was the box it was sold in, wasn’t made before 1955. Taken together, the clues indicate that this 312 Premier was in all probability made in the Early Republic period between 1955 and 1960. Premiers, as the book tells us, also seem to be fewer in number than their De Luxe kin, so this is something rather special, all told. Now all you need to do this kind of reading for yourself is get a copy of the book and those catalog reprints, right? We’re working on it. Almost half-way through the book’s layout & design! Weight: 2.10 oz. / 60 gr. Bowl Height: 2.032 in. / 51.61 mm. Chamber Depth: 1.62 in. / 41.31 mm. Chamber Diameter: 0.747 in. / 18.98 mm. What a fascinating read Mark. I can’t wait to finally get that book into my grubby little paws! Thanks, Marc! I really don’t want to be the gate-keeper on any of this intel, just want everyone to know it’s on the way. I, too, can’t wait for the book! You and me both, Tom. Good info – great detective work, which we could all accomplish and appreciate IF YOUR BOOK WOULD COME OUT! I think y’all are holding out for the 175th anniversary…. I promise you Linwood not a single day goes by that we’re not working on this. If you know anyone who’d like to do my day job for me and speed up the process, send me their address! Great article, Mark. This is exactly the type of historical detective work I love as a pipe collector! Me, too. I guess that’s where the book is coming from. What a perfect and easy to understand analysis. We really need that book! Now tell me, is this pipe still unsmoked? It is. At least for another hour or two. I just polished up the ferrule & put some obsidian oil on the stem, so all systems (or at least one System) are / is ready to go. And thank you for the kind words. Previous Post04. The New Peterson Nomenclature Stamping.